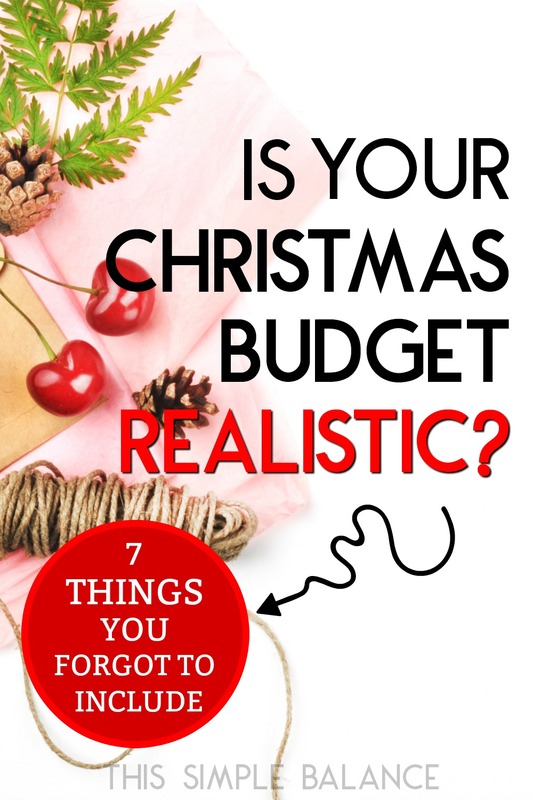 Inside: How realistic is your Christmas budget? If you’ve only factored in gifts (and maybe stockings), I guarantee you have underbudgeted because you’re forgetting to include so many Christmas items that all cost money – and they’re not cheap. It’s only August, and Christmas seems REALLY far away. But unless you want to have a super depressing January after December’s credit card bills arrive, now is the time to start creating this year’s Christmas budget. Paying off last year’s Christmas debt is not a fun way to start your new year, especially when New Year’s is supposed to be a time for inspiring goals and fresh starts. Here’s the thing about Christmas budgets: most of them are not realistic. They focus exclusively on the cost of the gifts – the ones that end up under the tress. 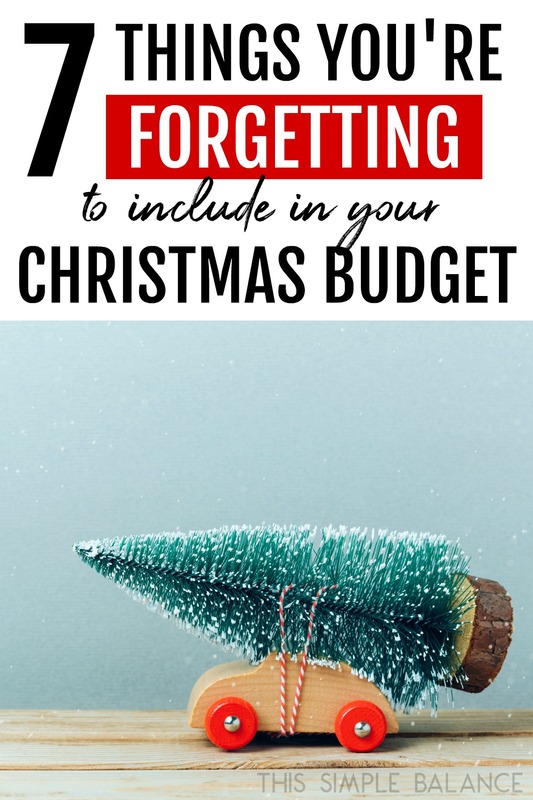 Very few take into account all the other Christmas spending that usually occurs during the holidays, which means your Christmas budget is seriously flawed. Last January I started thinking about Christmas budgets because we seriously overshot ours. I went over the numbers again and again: all the gifts added up to the amount I had set aside. So where on earth did the rest of the money go? With a lot of digging, I realized that I missed several extra expenses when I initially created our Christmas budget, and all those extra expenses came to a significant amount of money. I am determined not to repeat my mistake this year and am creating a more realistic Christmas budget. I hope you can learn along with me and not have the same January experience that I did last year. 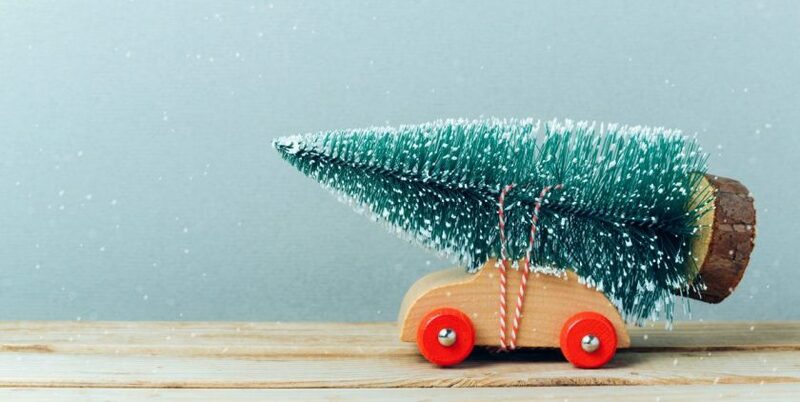 If you are the type of person who loves to choose a different theme every year and decorates your home and tree accordingly, this will especially apply to you. But even if you just add a few new decorations every year, it still adds up. My walk around the Target Christmas spot last year taught me that the nice ornaments aren’t cheap. At $3-4 each, if you buy 7-10, you are looking at paying anywhere from $21-$40 just for ornaments. Lights are even more expensive! I made the mistake last year of buying blind-your-eyeballs white LED lights (yuck!). By the time I strung them on the tree, it was too late to change them. This year’s Christmas budget will include 4-5 boxes of new warm/yellow lights, which are getting extremely difficult to find these days! If you buy a real Christmas tree every year, that’s another significant expense depending on where you live. We used to pay $40-50 a year for a real tree when we lived in Boston. After a few years of spending our limited Christmas budget on real trees (with 4 kids to buy gifts for), we decided to invest in a fake tree a few years ago, and man is it nice to use that money for other things! I did buy a balsam fir candle on sale and only burn it at Christmas to get that fresh tree scent for less. Mantel décor, a Christmas wreath, fresh garland for your banisters, a new tree skirt. You need to budget for this stuff. Think about what you spent last year and what you need/want to buy this year. Then make a realistic estimate. Do your best to stick to your budget! As the years pass, your estimates will get more and more accurate. While many people are shifting to electronically delivered Christmas cards, others love and don’t plan on giving up the traditional physical cards. For many families, Christmas card expenses are not just the cost of the cards themselves or the stamps to mail them, but also Christmas photos. Even a mini family photography session can cost hundreds of dollars! You may not consider this part of the Christmas budget, but you could include it here as many families use these photos for Christmas cards and grandparent gifts. Almost every family I know has Christmas traditions. These can range from an inexpensive drive around the neighborhood to look at all the Christmas lights to a trip on the local Polar Express. Take gingerbread houses, for example. Kits can range anywhere from $10-20 a pop. Even if you decide to DIY it, the baking supplies plus the frosting plus the candy to decorate can still get expensive. Depending on how many kids you have, even this one simple activity alone could cost $50-$75. You need to add that to your budget. We have very few Christmas movies and plan on buying one or two new ones every year to add to our collection. That’s another $10-20. Some families buy a new advent calendar every year, others add to their Christmas book collection, and still others buy new Christmas pajamas for everyone. Take a moment to think through all of your traditions and what you typically spend. Write it down: there’s more. You might consider Christmas meals to be part of your grocery budget. If that’s the case, you’d better significantly increase your grocery budget in December! How high this number goes will largely depend on your traditions and whether or not your host Christmas parties or large family gatherings. My husband’s family makes a really big deal out of Christmas Eve foodwise. He wanted to carry on the tradition, so we typically buy nice appetizers and beverages for Christmas Eve. We tend to keep Christmas dinner simple, but even the simplest of Christmas dinners usually involve a more expensive meat than we typically buy and desserts with pricey ingredients. If you’re new to budgeting, you may have a difficult time estimating expenses in this category particularly. In that case, it’s always best to estimate higher rather than lower. I’ve never heard of anyone being sad because they had money leftover in a budget category. Maybe some people do include this number in their Christmas budgets, but I rarely see it referenced. Up until last year, we spent Christmas with family. So, guess who paid for the stockings? Yep: Grandma and Grandpa. I had no idea how much stockings cost! When you multiply that times four kids: yikes. It’s practically another gift entirely (or two!). You can reduce the cost by getting cheap items from the Dollar Store, but these tend to clutter up our houses and break on the same day, though there are a few good Dollar Store buys. I have come to think of it as another gift and budget accordingly. If you’re trying to save money on this category, remember that stockings do NOT need to be full to the brim, and they do not need to as expensive as we make them. Anyone who loves baking knows it’s an expensive hobby. If you only bake around the holidays, you might underestimate the cost of the most basic ingredients like chocolate chips, butter and sugar. When you add in sweetened condensed milk, coconut, cream cheese and more, you are looking at a significant expense. If you typically give tins of cookies or fudge to several neighbors, be sure to calculate the cost of ingredients, tins, and paper to separate the layers. With DIY gifts (baked goods can be included here), you face the same problem. DIY seems like the cheapest route at first, but unless you already have the supplies on hand, they can be quite expensive. I recommend doing DIY gifts only if you have the supplies on hand and/or you just love to make your own Christmas gifts. Last, but not least, many people do not account for increased charitable giving in December. Did you know that 31% of all charitable gifts are made in December? Crazy, right? (source). Everyone is trying to get their tax deductions in, and it seems like every non-profit comes out of the woodwork around this time to ask for year-end gifts. There’s definitely a connection. Besides general year-end giving, there are always multiple Christmas-related giving opportunities for families who cannot afford gifts or Christmas dinner. If you typically pack a shoebox with gifts to send to a child overseas or give a gift to a child living in a homeless shelter or help buy Christmas dinner for a needy family, factoring that giving into your Christmas budget is essential. I’m not going to spend a ton of time here because this will vary SO widely based on your family size, income level, how many people you buy for, etc. People spend anywhere from $20 a person (or less) to hundreds of dollars per person. BUT, I will say that you need to factor in the following when determining how much to budget for Christmas gifts. While you are certainly not required to give these types of gifts, many people plan to give gifts in at least one of these categories. Again, if you plan on it, budget for it. Were you surprised by how much you weren’t factoring into your Christmas budget? I was, too. Many of these things make Christmas special, and I don’t think you need to give them up necessarily. You do need to be aware of how much they actually cost, and you do need to budget for them. When you create a realistic Christmas budget, you are much more likely to have a debt-free Christmas and a much happier January!